above: mountains in west TX covered in snow from Winter Storm Goliath. With such a long visit with East Coast family near the end of the year, we originally thought of either spending the winter in FL or meandering across the south and skipping the Quartzsite AZ gathering in January since that would require a lot of driving in a short amount of time. We didn’t want to spend winter in FL for a couple of reasons. 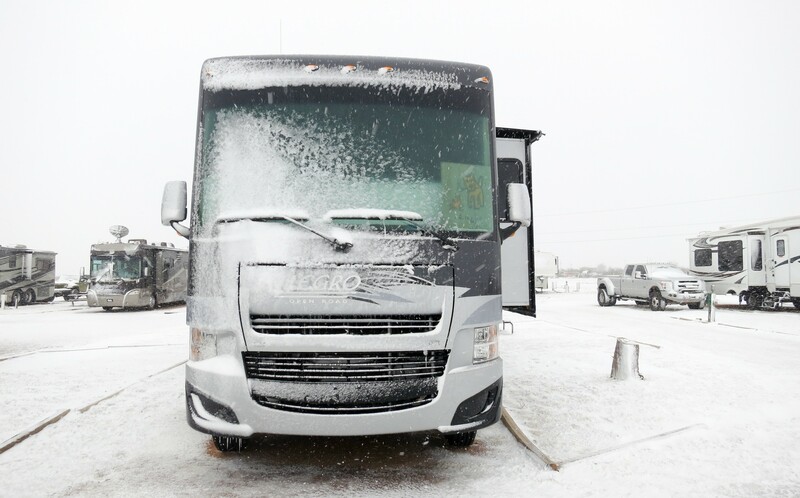 First, it’s a huge snowbird destination which makes it difficult to find reasonably priced RV parks in the winter. Second, there are a lot of things to do (in our opinion) on the west coast and we didn’t want to wait until March/April before heading west. Surprisingly much of the South does get cold during the winter, so meandering through the southern states wouldn’t mesh well with our distaste for colder weather. 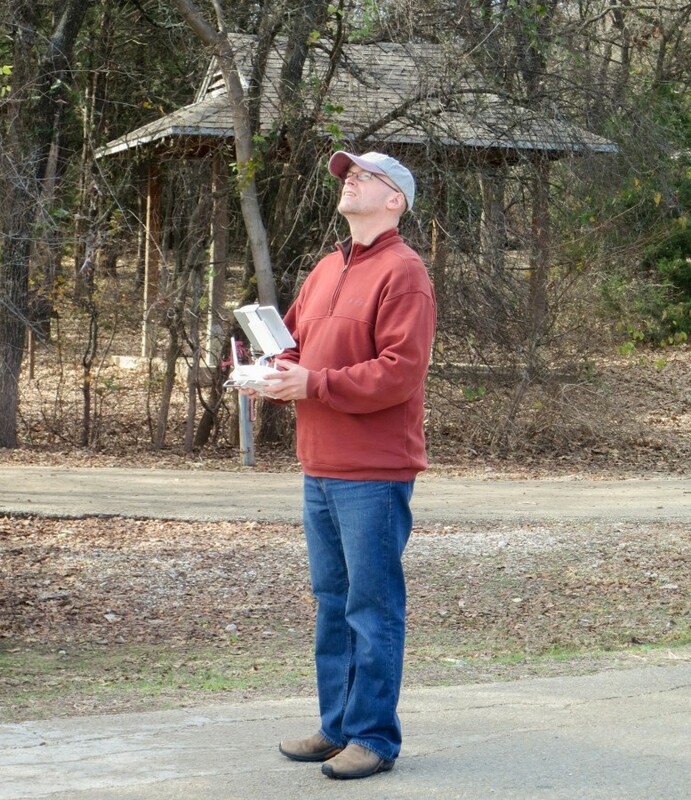 Mike practicing his drone piloting skills. After talking about it, we decided to just push hard to get over to AZ in two weeks. Usually we drive no more than 250 miles, then stay in one place for a week or longer. For our drive to AZ, we threw all that completely out the window. We decided to break the trip into two parts: 3 days of driving from southern FL to Dallas TX (1,200 miles), take a week off, then 3 days of driving from Dallas to Tucson AZ (1,000 miles). Since we hadn’t done this kind of extreme driving in Rover before, we did a practice run from GA to FL to make sure we could handle it. At 420 miles and 7.5 hours of driving, we knew if we couldn’t manage it, we would have to go to Plan B (after we made up a plan B) to get to AZ. Our practice drive went quite smoothly and we discovered a few helpful tips. Swapping drivers every two hours is perfect for us. It’s long enough to get pretty far but not overload on driving while the passenger has time to relax (or nap in my case). While driving the interstate is boring, it’s easy and not as stressful or tiring as driving US highways. Lastly, Opie really needs Dramamine to help him relax/sleep through the drives without getting motion sick. Our first overnight stay at a Walmart. 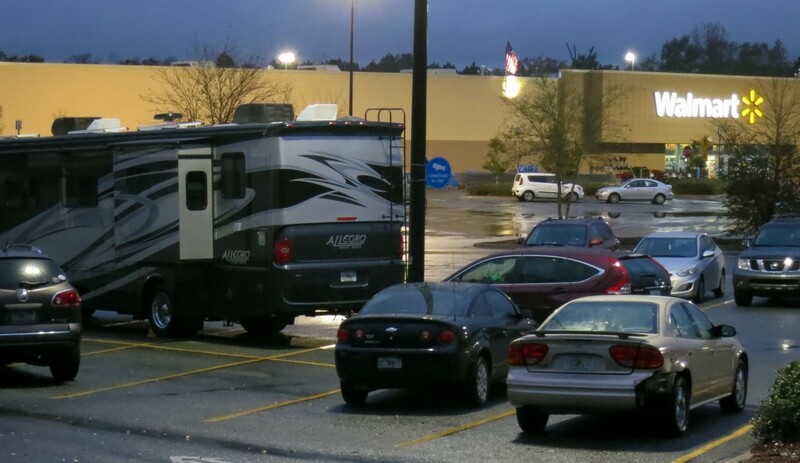 We did have our first ever overnight Walmart camping during the first leg of our journey. We checked-in with the store manager, found the right area to park in, confirmed we could open our bedroom slide, did our grocery shopping, and headed out the next morning. It’s definitely not like staying at a campground, but it’s only one night, close to the interstate, and free. If we needed a place to park for one night, we’d do it again. OvernightRVparking.com is a great resource to help find free overnight parking spots. It is a paid site, but worth it if you need to find free places to park. Walmart, Cracker Barrel, Cabela, and Camping World are some of the places that may let you dry camp for free in their parking lots but not all will allow it so calling in advance or using the site to double-check is always a good idea. Last year at this time, we were further south in TX (Austin, Big Bend and Fort Davis) and were pleasantly surprised by the TX drivers on the roads… safe and courteous. When we made it to Dallas, we expected the same type of drivers, but we were sadly sadly mistaken. Many will cut you off, randomly break traffic rules: blow through a VERY red light to get in front of the cars, follow ambulances on the emergency lanes/shoulders, and forget they have turn signals. I think we both decided to keep our driving in Dallas to a minimum to keep our sanity (and our car dent-free). Six Flags Over Texas, our last roller coasters for a while. While in Dallas, we hit our last Six Flags for the year. That makes a total of eight different Six Flags parks on one season Pass! A great way to check out roller coasters but I think we’re definitely coaster’d out now. If we happen to be near an awesome coaster during our travels in 2016, we might try it, but otherwise 2016 will be coaster-free. One of the many flooded campsites at Loyd Park. Most of our Dallas stay was walking through our (mostly) flooded campground, playing with Mike’s new drone, and girding our loins for the next leg of our journey west. 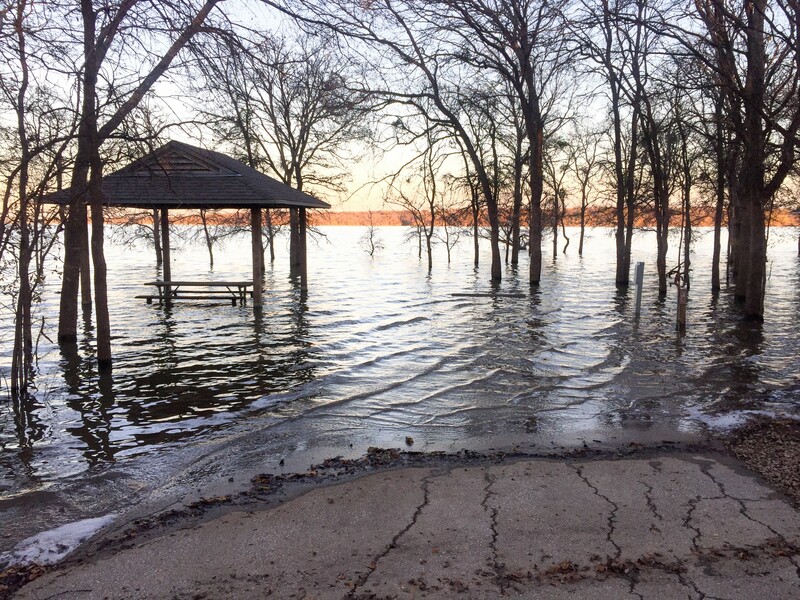 Due to heavy rains this fall, much of the county park campground was underwater so the trails and lake beach were inaccessible. We did make it out to see the new Star Wars movie, having remained spoiler-free since it opened the week before. Thank goodness Mike plans obsessively. Watching the weather, he noticed that Winter Storm Goliath was going to hit Odessa, TX on Sunday, at the same time we were driving there for our next overnight stop. If we instead hunkered down in Dallas for a couple extra days, we would get a LOT of rain (in a flooded campground, that could be bad news) from the storm. If we left Dallas a day early, we could try to drive past Odessa and wait out the storm further west (with less snow) but we might hit a lot of rain and wind during the drive. We chose the latter option, left Dallas a day early and drove 510 miles (our longest drive ever in Rover) to Van Horn, TX. Glad we weren’t driving today! By the time we arrived the temperature had dropped from 70 to 35 degrees. Freezing rain and snow started, wind increased, and the campground power went out. We pulled in our big slide to conserve heat, turned off all extraneous circuits, turned on the propane heat and hunkered in the covers for the 20-degree night. Since the next day’s forecast called for snow, we stayed at the campground to wait it out. The campground did recover electricity that morning, and since the wind died down we were able to open the living room slide and nest comfortably watching it snow lightly for most of the day. We checked the news and saw that a tornado had touched down in Dallas about 12 miles away from the campground we were at, and another one completely destroyed a campground on the north side of Dallas. Living in an RV, we really really don’t like tornadoes! Odessa had gotten a lot of snow, so given the options, we made the best choice to weather the storm. 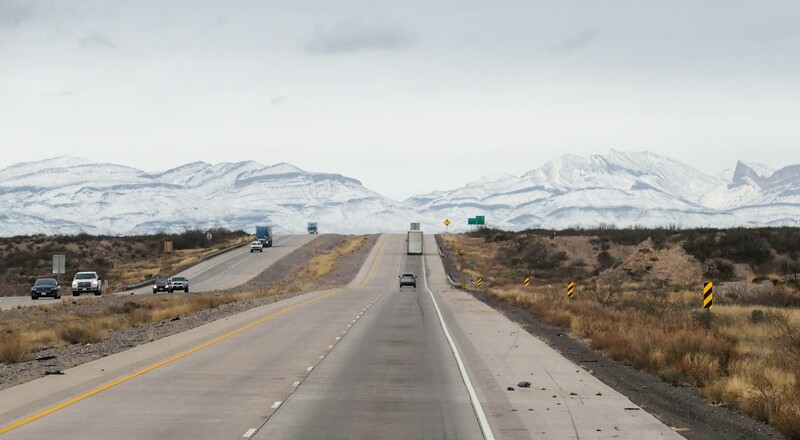 The next morning after the storm had passed we headed out of Van Horn TX, and drove an easy 230 miles to Deming NM, through some beautiful snowy mountain scenery. 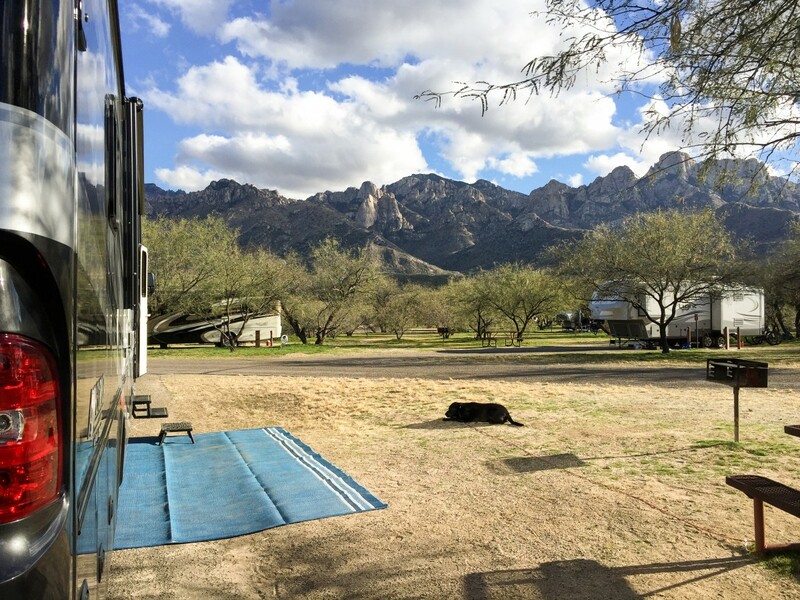 Finally, the next day we drove our final 230 miles and made it to one of our favorite campgrounds, Catalina State Park in Tucson AZ, where I am now sitting outside in a t-shirt soaking up the sun and thankful that the past few days are now simply memories. Looks like our travels may cross in the Denver Area in September/October. We spent over 2 weeks there last fall and plan to revist again this year. We stayed at the Yogi Bear Campground, in Larkspur, but it was a huge dust bowl. There was a nice campground a bit further south, in Monument, that we may stay in this year (close to family). Colorado Springs was a really nice area, with Pikes Peak and the all the wonderful restaurants. Bring empty water containers for the free water direct from spigots from the mountain springs. This year, we will probably tour the northern side of Denver in our 36 LA, so I’ll keep an eye out for where you guys are! Cool! We’ve heard nothing but great things about Colorado. Hopefully we’ll run into you this year there and you can give us the scoop on what to visit and see! Looking forward to meeting another 36LA’er! So glad we met up with you two and Opie at Catalina. Connie and I will be following your blog. As a native Dallasite I must agree with you on Dallas drivers. I hate driving in my home city. Can’t wait to delve deep into your previous posts. It was so good to meet up with the three of you! I’m still sad that I didn’t get a chance to smuggle Pepper into our family. :) I saw your blog, you take some fabulous photos of the birds! I’m very impressed. It’s a crazy El Nino’ year for sure! No joke! I keep waiting for the warm Arizona weather but we seem to be hitting a fair bit of rain and cold. I guess we’ll be pretty waterlogged this winter.